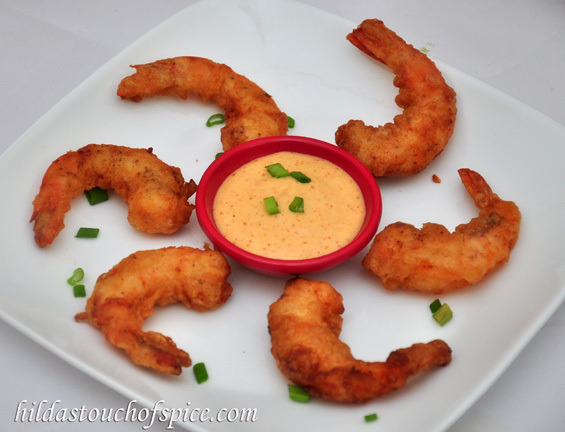 These lovely fried prawns are an excellent finger food and a perfect snack for prawn lovers! They pair wonderfully with cocktails and mocktails. These prawns are coated in a beer batter and deep fried which makes them light, crispy & golden. Wash, peel, de-vein and butterfly the prawns, leaving tails intact. Prepare the beer batter just in time to eat .. When ready to fry the prawns, combine the batter ingredients in a sufficiently large bowl with a slotted spoon. Using a spoon instead of a whisk to mix the batter, keeps the batter thick & lumpy and the lumps become crunchy when deep fried. If the humidity level is high then the ice cubes tend to melt quickly and the batter turns runny so you need some extra flour to thicken the batter. Leave the batter at room temperature until the ice has half melted; start using immediately at this stage. Heat oil in a hot wok/kadhai until the surface of the oil seems to shimmer slightly. Lightly toss prawns in dry flour. Use a zip lock bag it helps to coat the prawns evenly. Hold each prawn by the tail and dip it in the beer batter, one at a time to coat completely, letting any excess batter to drain off. Fry prawns in small batches in hot oil and deep fry for about 1 minute or until just cooked through and lightly golden.Do not overcook. Use a slotted spoon to drain the prawns completely and transfer on to tissue paper. Repeat the process with the remaining prawns. 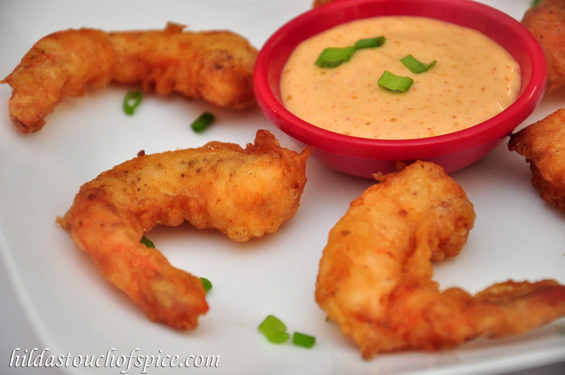 Arrange the crunchy & crispy Beer Battered Prawns on a platter and serve immediately with your favorite dipping sauce.